And so, we come closer to the centre of the mystery of Christ, The Word of Life. Soon and very soon, we shall celebrate the great Feast of the Incarnation – Christ Mass – the Feast of the Eucharist of Christ himself. The Word made flesh – The Word of Life which John says ‘was from the beginning’ – being revealed within history. Perhaps the most powerful story in scripture of this Word of Life at work is the account of the resurrection of Lazarus. Jesus stands outside the tomb and cries out ‘Lazarus, Come Forth!’ Lazarus is summoned by the Word of Life from the non existence of death, to Life in its fullness. As a favourite writer of mine likes to say, God in Christ did not die to make bad men good, he died to make dead men live! So this Word, which Is Christ Jesus, is The Word of Life in the most profound sense . . . and in our Gospel Reading, again we observe this Word at work in calling forth life. We see it, and of course part of the tradition of the church is devotional art and ikons. In ancient ikons and in the tradition of the Syriac Church, Mary is depicted as conceiving Christ, through her ear. This is a visual metaphor for what is happening. So Mary’s response to Gabriel, ‘let it be to me, according to your word’, is much more than a simple, if breath taking obedience – rather it is the speaking forth of what is happening. It is according to the Word, the Word of Life, finding its place within her, that she will become the very bearer of God. This is the How of the very creation. The Spirit hovers over the face of the Deep, The Word comes, Life springs forth. So the Word enters Mary and the Word of Life springs forth! ‘And it happened that when Elizabeth heard Mary’s greeting . . . ‘And it happened . . .’ the Greek word is egeneto – the word from which we get Genesis – the Beginning – Creation language! So, The Spirit born Word comes to Mary to be borne by her, and now Her greeting, full as she is of the Life of God, brings Life! And the language is so very physical. ‘As the sound of your greeting entered my ears . . .’ We are called to use our imagination to See, to Behold this Word passing into the ear of Elizabeth. as you received the spoken Word of God’s messenger, the one carrying the Word from God . . . there is something tangible about this Word, it is carried, it enters the ear – the ear which the Psalmist says in the most physical of language ‘you have dug for me’ . . . God has carefully crafted us with ears to hear – the Word of Life – this is why we should if at all possible NOT look at the screen with the reading on it, I understand that this is good for the hard of hearing, but listen – Allow the Word to enter your ear – to come into you, to bring Life. ’As the sound of your greeting entered my ears, the baby in my womb leapt for joy!’ How often I wonder have we known our heart leap for joy as the Word enters our ear, created for this very purpose. This is the nature of The Word of Life – when we hear it, when it enters into us – it produces Life in fullness. We become Full of Life, Full of Grace! As we prepare once more to Hear the Angelic announcement – may our ears be open and our hearts prepared for this Word of life to come into our hearts, to find a home amongst us and within us. Life in our household is always very full on at this time of year. I try to avoid the word ‘busy’ which can seem puffed full of self importance. ‘Busy’ people are of course ‘ the people who really count!’ However this year we find ourselves more than usually working every hour that the Good God provides for us as we prepare not only for Christmas, but also for a wedding. Of course we have a tendency in this day and age to think of ‘God’s Holy Law’ in terms of what might often seem like ‘an arbitrary set of rules’, but I do not think that this is either right, nor helpful. Rather God’s Holy Law is a Revelation of God in Jesus, and the shape of form of our existence within the Creation. To put it another way, God’s Holy Law is the Revelation of ‘The Grain of the Universe’ – in other words when we follow it we reveal something of the Nature of What Is, The Creation, and thereby also the mind of the Creator, the Mind of God. And so to Mary. Mary it must be said, and may the Good God have mercy upon us, has become a most uncomfortable figure for so many in the modern world. Good Protestants that we are, even if we believe the words of the Creed regarding her Virginity, we tend to think that the veneration of Mary especially within the Catholic Church is overdone!! I know that that was most definitely my own perception and after all, I Knew! I had taught in a working class Catholic High School as a very Correct Protestant, and all the excesses I was so sure were true, behold, there they were . . . there’s none so blind as those who think they can see! My – mainly Catholic – colleagues, knew of my discomfort and would use every opportunity to tease me, not least when during some building work my immediate superior had an 8 foot high statue of The Queen of Heaven, which had to be temporarily re-sited, temporarily re-sited beside the desk in my office “where our Lady can keep an eye on you, Eric”. Of course, if I was a Really good Protestant, I might have had more pause for thought in my self righteous judgement of Catholicism with all its nonsense, after all who was it who said “the Veneration of Mary is inscribed deep in the human heart”, but Martin Luther himself. Holy Mary, Mother of God . . . and of course we may well take a moment to ponder. One of the deepest losses of our ‘busy’ lives is that we skim over the surface of things. That we pay little or no attention to those questions which arise from the deep wells of our Existence. Last week I asked the question ‘Where are you from?’. Like the question ‘How are you?’ – it has become little more than a marker, no more than a seeking after ‘a fact’ – but How Are You? Where are you From? These are questions which take us deep if we will but let them. And there we find buried clues which point us towards The Grain of The Universe, God’s Holy Law, not least that of Motherhood . . .
Of course it is in a sense a not entirely truthful answer, perhaps we ought to have said, from England, but then the more you think about it, the more we realise that ‘where are you from?’ is a very deep question – a question that ought to give us pause. Like the polite enquiry, ‘how are you?’, it requires a deeper more significant answer than we often give it . . .
Of course in a sense here in New Zealand we might be aware of a sense that there is a deeper answer, for Tangata Whenua introduce themselves in deep terms of who they are in terms of where they come from, my mountain, my river, my waka, my iwi, my whanau – a sense of ‘coming from’ or having our roots in a much bigger story than ‘where I live at the moment’, a sense of coming out from a river of human history that has a source in the deep past – a way of self understanding that is almost diametrically opposed to our Modern way of understanding, where a little like the Prodigal Son our roots are something we put little store by, where we come from is a place we are trying to get away from, to forget our Home, our Source – trying to ‘make a life for ourselves . . .’ Where are you from? Advent, a season of preparation to receive one who is coming to us – but from Where . . . ? When Jesus stands before Pontius Pilate, who is growing increasingly panicked by the crowd but also by the silence of this Galilean prophet, he asks in his anxiety, ‘Where are you from?’ It is as if he sees something in Jesus which suggests that Jesus is ‘not from around here’ . . . and so it is with the one sent to prepare the way of the Lord whom we remember on this 3rd Sunday of the season. John, John the Baptist we are introduced to him as one sent ahead . . . but from where?? Mark in his gospel, a gospel which as Bishop Steven said last week is abrupt – it pulls us up – it lacks the niceties of the other gospels – Mark introduces John thus ‘John . . . appeared in the wilderness . . .’ Just like that! It’s as if he just pops into existence – where are you from John? A couple of weeks ago I asked if we realised where we were? If we had a sense of our place in the Creation – how we fitted in – how our existence was woven into the life of the trees and the birds. Certainly on the whole, to be a Modern person is to have lost that sense. Just in the way we move around so freely, the very idea of Home is one which is disappearing from our senses. Home of course is one way of answering the question ‘Where are you from?’ – but where is Home? This reminds me so strongly of a story I told just a few weeks ago of an elderly lady who was dying and who was asked by her doctor, ‘where are you from?’ To which she replied without a moments hesitation ‘From God’ – and being baptised and knowing her faith well she might have used the words which described Jesus, ‘knowing that he had come from God and was going back to God. The ministry of John the baptist is marked by a remarkable freedom – he wears strange clothes, he eats strange food, he lives in strange places. When asked who he is, He proclaims without fear that he is ‘just’ the voice of one who cries in the wilderness – or put another way, he is the mouthpiece of God himself – that the Life in Him is the very Life of God bearing witness to that Life coming into the world in Jesus Christ – a Life that comes from somewhere else – Where are you from?? As we shall hear once more this coming week – to whoever believed in his name Jesus gives the power to become children of God, who were born, not of blood or of the will of the flesh or of the will of man, but of God. . . .
Home – a place of rich stories, a place of wonderful meals, a place buried deep in our human memory. As this season of the year awakens so very many memories, may we Know deep within ourselves the answer to the question . . . The Advent Antiphons are said or sung before and after the Magnificat at Vespers each evening of the week immediately prior to Christmas. Each one speaks of an aspect of the One who is to come, Israel’s hope and a Light to the Gentiles. This set of reflections juxtaposes each of the Antiphons with one of the seven ‘I AM’ sayings of Jesus Christ, the embodied Hope of all Creation – the Word made flesh. Immanuel, ‘God with us’, we know from its root in Isaiah, is a sign of the one who ‘is coming with judgement to save us’. [Psalm 50, one of the great Advent Psalms expresses this as the prayed Word of God] And thus also of an imminence beyond our senses and comprehension of The Transcendent One. He who Is Other, whose ways and thoughts are most assuredly Not ours comes to dwell amongst us. In this simple Antiphon, all the Antiphons coallesce and find a home as the Hope of the Nations comes to us. Almighty and eternal God With Us – the Judge who comes to Save us – who commands ‘unless you eat the flesh and drink the blood of the Son of man, you will have no life within you. Advent, primarily is about Faith. Faith makes us Expectant. Faith is the midwife of Hope. Faith causes us to Watch, to Wait, to Listen, to Strain our senses to catch the first rays of the rising dawn. By Faith we acclaim Christ as King of the Nations, the Lord of All. By Faith we Know him to be The Way to the heart of the Father, the Wisdom which at once describes and IS all of Creation in its plenteous goodness. And by faith we now come to the Great Feast – where we feed on him in our hearts by faith. It is when we assent to these apparent impossibilities that our eyes are opened and we See and are healed. School, on the whole is not good for the soul. Often as I took parties of youngsters onto the hills of Northern England I would reflect on how much more humane were our encounters away from the classroom. Schooldays we were told were the happiest days of our lives. Many, indeed in all probability most, would beg to differ. Amongst the many humiliations of my early schooldays, one endured by countless youngsters over the ages was the weekly football. (I have two left feet, dances find me lurking in the kitchen or indeed the bar, trying to escape the horror of the invitation to dance and the inevitable disappointment of my partner.) But probably worse than the humiliation of playing Football, of endless freezing cold afternoons in the bulk buy nylon Wolverhampton Wanderers strip – the details are etched in my mind, as with an iron tool upon lead – worse than all of that was the ritual of picking the team. Week by week the two best footballers would take turns to choose their team. Some of my gifted classmates would jump up and down saying ‘pick me, pick me! !’ and find themselves as the glamour boys, the strikers, then there were the not outstanding, but not incompetent ones who would pack the midfield, then finally the scrapings. Week in week out, without fail. Being chosen carried nothing glamourous – I was amongst the ‘no choice’ candidates – to occupy the Defence. Picked for standing around doing nothing if your team was doing well, and being shouted at by the rest of the team when, as was inevitable, the Good players ran past you as if you weren’t there and scored a hatful of goals. The PSychotherapy has been expensive and only partially successful! Of course, the idea of being chosen usually carries with it a certain kudos. Being chosen to be head boy or head girl at school, Being chosen first for a sports team. You are Wanted – You are special, and ‘the chosen ones’ at my High school – the First XV rugby team wore their chosenness as many do – corridors cleared ahead of them – we were taught to live in fear, an almost Holy Awe of these chosen ones, who did not wear their election lightly, but KNEW they were Special. Being chosen is also an integral part of the story of our Common Life and faith. Last week we rehearsed the story of ‘God’s Chosen people’, the Jews, as we built up our Jesse Tree, but this is chosenness of a different order. (Indeed although my spellchecker does not recognise ‘chosenness’, if your Google it – every hit is a reference to the Jewish people). A Substantial part of the story of Israel, was the constant stream of humiliations visited upon them when they forgot that their being chosen did NOT mean that they could behave like the first XV. The focus of their faith was not that they were chosen, it was the one who had chosen them. Not WE have been called by God, but ‘we have been called by GOD’ Called not to be full of themselves, rather to be empty of themselves, and quite literally full of God, as revealed by the Temple in the midst of them. A chosenness which was not a vehicle for self regard, a cause for pride – a chosenness which required Absolute attentiveness to God, expressed in Faith Full Obedience. Now there is One way of telling this story which goes like this. God Created the world full of goodness, chose Israel and they screwed it up, they weren’t up to it – therefore God had to put into effect Plan B. Jesus as it were as an afterthought – a second try, and indeed we might then look around us and hope that God has a plan C. But like joining the dots, its always possible if you have enough dots to draw whatever you like. So whilst there are elements of truth in the story that so many tell, it is wrong in two key elements. Firstly that Israel was Chosen to be the bearer of the very Life of God, in the Word made Flesh – in Jesus Christ. That was Always the plan, that God himself would dwell amongst his people, and that through them All the nations of the world would be blessed. That was what the faith of the Patriarchs in particular Abraham, ‘the father of many nations’. And the ‘Jesus was God’s plan B story’ is also told wrongly, because it says ‘Everything had gone to the dogs – there were NONE who were righteous, none whose attention was still on God and his promise. Yet the story of the people of Israel is throughout the story of a faithful remnant, even though the people as a whole go astray. As Advent moves to its climax, the hopes and fears of all the years are coming into sharp focus in two of these remnant of faithful Israel. Mary, who without realising why ‘has found favour with God’ – When our attention is on God, even the fact that we are attentive to him is hidden from us, and , oh yes Joseph . . . also chosen . . . like Mary, like faithful Israel, chosen for obedience. In Year A we focus on Matthew’s gospel and thus the account of the birth of Jesus is told through the story of Joseph – not his perspective mind you. We get little or no insight into the workings of Josephs mind. I remember once seeing a wonderful stage play which was in effect an extended dramatic monologue of Joseph in his carpenters shop musing on being ‘chosen’ in this way. We like to do this – to put ourselves in Joseph’s place – but really when we do this we are dragging Joseph into ours. We project how we would feel onto him. None of us know how Joseph would have felt. And such flights of fancy distract us from what Matthew tells us. Joseph we are told discovering that Mary is pregnant ‘being a righteous man and unwilling to expose her to disgrace, planned to dismiss her privately’ – Joseph ‘being a righteous man’ . . . Sadly and I think to our almost infinite loss, the word righteous as an adjective for a man or woman, has become horribly devalued. Because of our focus on Jesus and his encounter with the Pharisees – because of our own experiences of some people with whom we rub shoulders, because of a failure to understand properly what it means to be a sinner, or a saint, indeed to totally misunderstand the Work which Jesus comes to accomplish, we do not think the word Righteous can be a truthful life giving adjectival modifier of ‘Woman’ or ‘Man’. And it has slipped from our speech. If we read someone was a ‘Righteous man’, we tend to think they are at best unutterably dull, or at worst a hypocrite – usually a combination of the two. But this is not the witness of Scripture. Indeed if we have been attentive to our Advent readings we read of ‘A righteous branch to spring up for David’ – Jeremiah’s version of the Jesse Tree. Joseph is a righteous man – that is he is of the type described in Psalm 1 – to be righteous is to be attentive to and obedient to God Happy is the one who does not follow the advice of the wicked, or take the path that sinners tread, or sit in the seat of scoffers; but his delight is in the law of the Lord, and on his law he meditates day and night. They are like trees planted by streams of water, which yield their fruit in its season, and their leaves do not wither. In all that they do, they prosper. – These are the ones who are marked as Righteous in the Scriptures. There is nothing of Self Righteousness in them – they are not absorbed in how they appear to others, they are absorbed in and absorb like Water from a stream, the Life of God. In a Very important sense they are the chosen – Called AND chosen – responsive to the Call of God – He is the focus of their faith. One of the deepest mysteries of our faith is how God puts himself into our hands – he is in a strange sense reliant on those he has called. And this is VERY important for how we understand Jesus. Jesus is both utterly divine AND utterly human. It is all too easy to imagine Jesus as a ‘special case’ in his humanity – as if his humanly obvious righteousness, his life of prayer and fasting and obedience to what God says to him, is entirely a one off. But to do that is to as it were see his human life as nothing more than a veil for his divinity. It is as if we say – Jesus can only be attentive to the Father Because of his divinity. It is to say that it is Not human. But precisely because Jesus IS fully human, that Righteousness we see in him is not only divine but humanly transmitted, through Mary and to the external observer, through Joseph as well. The Righteousness of Jesus is utterly divine, but also though MAry and indeed Joseph, utterly human. The scriptures take with full seriousness our human nature and how our life towards God is transmitted humanly as well as through the waters of rebirth. And Because Joseph is righteous, he is receptive to what God wishes to say. Faith revealed in obedience. The Christian life, the life of the Righteous, is a life of faithful obedience to what God is saying. 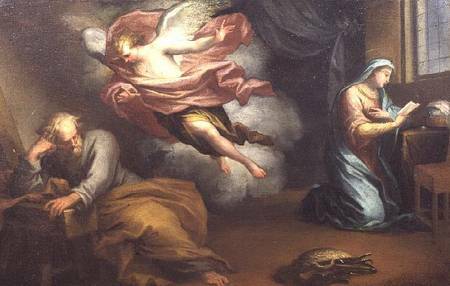 Of course Joseph at first tries to protect Mary – from the shame but then attentive, righteous Joseph is spoken to by an angel through a dream. ‘Joseph, son of David, do not be afraid to take Mary as your wife, for the child conceived in her is from the Holy Spirit. 21She will bear a son, and you are to name him Jesus, for he will save his people from their sins.’ Joseph, son of David – Joseph is announced as part of that Righteous branch of David that Jeremiah spoke of, the faithful Remnant. And he is given work to do ‘Do not be afraid to take Mary as your wife’ You Watch over her – and a tremendous privilege – and you will name him ‘Jeshua’ – which literally means God Saves. And BECAUSE he IS righteous, because He is Attentive and desires Only to do what God desires of Him, He Is Obedient. When Joseph awoke from sleep, he did as the angel of the Lord commanded him; he took her as his wife, . . . and he named him Jesus. and to you all nations shall have recourse. Come save us and do not delay. One of the wonderful traditions of Advent is that of the Jesse tree. Like the Evangelists we too rehearse the Ancestral line of Jesus, patiently day by day and hour by hour rehearsing the story of his long awaited Coming. As the Life of God waited patiently in the world, down through so many generations, so in Christ this line of Kings reaches fulfilment. The fulfilment of the Hope of Israel, the fulfilment of the Law and the Prophets. But who, to our astonishment and perplexity, like a grain of wheat falls into the ground and dies . . . to bear seed . . . how many fold? He becomes the source of Life for all who believe in his name and the work He calls us to is that of ‘believing in him’ – the work of patient trust – of Abiding in Him, as He Abides in us. He calls us to the Waiting of Contemplation, like that of a farmer watching his crops. This too us may well seem rather passive – like those who hear the word of Jesus telling them that ‘the work of God is to believe in the one he has sent’ – we have little time for contemplation. But thus we are easily uprooted from the vine, for we are then ‘free’ to be pulled hither and thither, this way and that. Prey to every Siren voice, we lose sight of the ‘dwelling place’ he has prepared for us in the throne room of His very heart. Those who abide in me and I in them bear much fruit, because apart from me you can do nothing. Over many years, the Word patiently waited, until the time was right. Down through the ages, through the line of Jesse, He Abided in his people. We too now are invited to Abide in Him, to in Contemplation behold His Face, that of the Father’s only begotten, and thus be transformed from one degree of glory to another. The Advent Antiphons are said or sung before and after the Magnificat at Vespers each evening of the week immediately prior to Christmas. Each one speaks of an aspect of the One who is to come, Israel’s hope, and a Light to the Gentiles. In this set of reflections each of the seven Antiphons is juxtaposed with one of the seven ‘I AM’ sayings of Jesus Christ, the embodied Hope of all Creation – the Word made flesh. Come, and teach us the way of prudence. To be Christian is, as it were, to live in a state of contemplation – that is that our attention is, like that of Mary upon him, in amidst ‘the many things’ He fills our vision and thus we can only ‘see’ the world through Christ. It is a commonplace that our age excels in distractions. Like the circuses of old, Distraction has become our way of life, so much so that we believe we are attentive not at all distracted. In so many ways we are surrounded by multiple media of distraction, each cleverly tuned to our attentive weakness. And when we are so entranced, so captivated – when ‘Distraction’ has become for us our way of being in the World . . .
Thomas, Jesus’ disciple blindly grasps for this knowledge. ‘Lord. We do not know where you are going. How can we know the way?’ Where is the map? What does the Way look like? Where are you going? Tell us these things and we shall be satisfied. And so he desires knowledge, apart from Jesus. Like so many of us today, understanding ‘faith’ in terms of ‘beliefs’ to which we may or may not assent, that we know for ourselves. Like the rich young man Jesus encounters, seeking an answer to the question ‘What must I do to inherit eternal life?’ Seeking to retain control through appropriate knowledge. Tell me and then I can go my own way. This double move is that from Knowledge to Wisdom. From the Tree of the Knowledge of Good and Evil which leads us away from the Goodness of Life, to the Tree of Life, and the One who resides there. St Paul says Jews demand signs and Greeks desire wisdom, but we proclaim Christ crucified, a stumbling-block to Jews and foolishness to Gentiles, but to those who are the called, both Jews and Greeks, Christ the power of God and the wisdom of God. For God’s foolishness is wiser than human wisdom, and God’s weakness is stronger than human strength. Consider your own call, brothers and sisters: not many of you were wise by human standards, not many were powerful, not many were of noble birth. But God chose what is foolish in the world to shame the wise; God chose what is weak in the world to shame the strong; God chose what is low and despised in the world, things that are not, to reduce to nothing things that are, so that no one might boast in the presence of God. He is the source of your life in Christ Jesus, who became for us wisdom from God. Ancient Wisdom – which danced before the Lord before the beginning of Creation – in his Flesh reconciling all things to God. To be Christian is to live in a state of contemplation. He fills our vision and thus we can only ‘see’ the world through Christ.